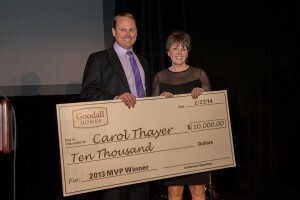 Congrats to Carol Thayer of Keller Williams Realty in Mount Juliet for winning the MVP Realtor of the Year for 2013.The Goodall Homes Realtor Gala was held on Thursday, February 27, 2014, and was a beautiful evening filled with a lot of celebrating! The event was designed to thank the realtors who brought their clients and sold homes with Goodall Homes in 2013. We met at the Music City Center in Nashville, and enjoyed dinner and festivities in the Grand Ballroom. Music and entertainment was provided by Todd Sholar (and band), Bailee Deese, and LouAnna Smith.